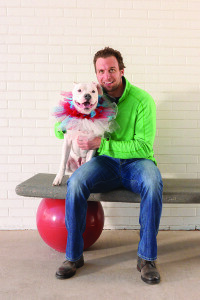 The Denver Dog Magazine – Nate Guenin, Colorado Avalanche Defenseman and Dog Lover! In ice hockey, a defenseman is one of two players on the ice whose primary responsibility is to protect the goaltender and prevent the opposing team from scoring. Along with stopping anything and everything from getting remotely close to the net, defensemen also assist their forwards so they can score. Defenseman play a huge role in the game of hockey, and though they may not always lead the team in scoring, the Colorado Avalanche scored a big one when they signed Nate Guenin! There are millions of homeless animals throughout the country, and pet adoption is something that Nate believes in and takes very seriously. “The team hosts a holiday fundraiser in which the wives and girlfriends decorate individual Christmas trees that are auctioned off for charity. Megan and I chose to donate the proceeds from my tree to the Longmont Humane Society because of their amazing dedication to find animals homes. If anyone is looking to adopt a new member into their family, they should definitely check them out!” I also want to add that along with Nate’s donation, he rallied to ‘assist’ me during the holiday season by loading up my “monster” truck load of toys, treats and food that I collected for the yearly I’m Not a Monster Holiday Drive and helping me deliver them to Longmont Humane Society. Talk about an awesome sleigh ride! There’s no doubt about it, the Avs picked a great guy when they chose Nate Guenin! Visit Zoey the Pit Bull Reporter on Facebook!